The weather people had issued a Severe Weather Warning after the rain on Monday: "Severely Perfect", that is. Cool, sunny, very good visibility. So we snagged a couple of nights in Curry Village, and drove up from the Bay Area on Wednesday. Spent Wednesday afternoon hiking up to Sierra Point (see link: SierraPoint) and looking at stuff in the nearby touristy areas. But Thursday was hike day. 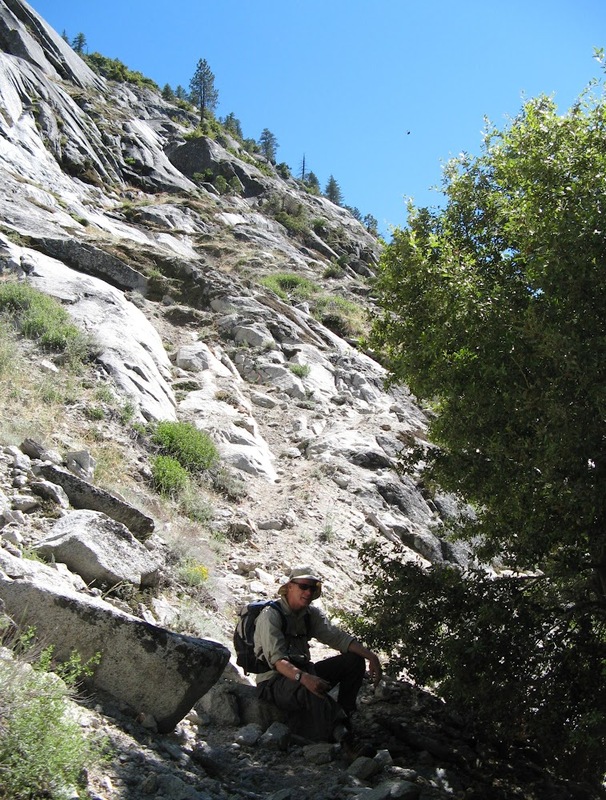 My hiking buddy had done the North Dome Gully once, and I knew all about Basket Dome. So why not just do them both? Waypoint 4 is the bathrooms on the road to Mirror Lake. Waypoint 5 is the top of Washington Column. That's a ten mile loop, including a descent on the Snow Creek Trail. There was another mile and a half, or so, on the valley floor starting from the bus stop, and on the return, a direct hike to Curry Village. I met a bear on the hill just above the bathroom. We conversed for a while, and then she ambled off. So why is this a bad idea for a hike? Well, first, it involves going up the climber's descent trail in North Dome Gully. More about that later. Second, the route up from Washington Column directly to North Dome is guarded by impenetrable brush and boulders beyond the top Washington Column, then a band of smooth rock. Lacking any info on that route, we elected to follow the climbers' use trail over to the top of the Royal Arches climb, a descent of about 600 feet from the top of the gully. From there I knew from past hikes that you could ascend relatively easily on the west bank of Royal Arches Creek. One can then pick up the trail from Yosemite Falls to North Dome, and head over to Basket Dome from there. The top of the route is just a few feet shy of 8000 foot elevation, a 4000 foot climb from the valley. With the dip down from Washington Column, plus drops to the saddles of North and Basket Domes, there is over 5000 feet of climbing to do, most of it off trail. Based on my feelings afterwards, I would say that this made for a tougher day than doing either the Half Dome Trail from the valley or the usual descent of Tenaya Canyon. In our case, my buddy didn't want to go all the way past Arches Creek, and I wasn't willing to go straight up the slick rock, so we compromised by going up the lower left edge of the slick rock most of the way. I only had to duck into the bushes twice, where the rock was just too steep for me, but the brush along that edge is as thick as a hedge. Finally, he got tired of climbing sideways and climbed straight up (which eventually scared even him, unroped as he was), and I veered west until I got out of the thicket.. I'm sure that an easier and more direct route up along the side of North Dome from Washington Column exists, but time was running out, and we didn't want to have to back off and try again. We considered looking for Chick-on's lost camera on the descent towards Snow Creek. But we'd had our fill of tough brush for the day, and his photo scared us off. See link: ChickOnBasket Those white spots in his second photo are not bare spots. They are boulders surrounded by brush. Besides, my buddy wanted to get water at the Snow Creek Bridge, and that's not on the lower route. So we went on the higher route up to the ridge and then down towards Snow Creek. Now, about the North Dome Gully. It's not a hiking trail. If you aren't a rock climber, don't try it. We did the original route, which is in the old guidebooks, and is easiest to find. Most climbers now come down a ledge-hopping variation for the upper third of the route, which goes more directly down from Washington Column and avoids the extra up and down. My buddy had come down that way once, following some descending climbers, and thinks that he would likely not find that route going up. People who get off route on this area tend to die. Even the old route is too tough for me these days. Since I have arthritis in one foot, I have to wear mountaineering boots that are stiffer than boards on the bottom, and which don't conform to steep slick rock or stand well on little nubbins. Twice my buddy had to toss me a belay, in spots that would not have slowed me down in my own rock climbing days (fifty years ago). Still, we knew for sure that we were on the easiest route. Get lost, and it immediately gets much harder. Edited 1 time(s). Last edit at 06/11/2012 08:53AM by wherever. Cool. I absolutely LOVE hearing about routes I've never heard of/thought of before. Thanks for the post and tips. I have yet to inspect this gully carefully up-close. Do have some aspirations, but I'm probably kidding myself. Maybe if there's path through trees/bushes. Yosemite Climbs book describes this as a use trail, mostly class 3. Perhaps a tiny section of 4. Does a good job breaking it down into numbered parts. When evaluating risk/reward, this probably isn't worth it. The views, though unique, aren't anything too special. But I'm happy to hear you had a safe, adventurous time. It's always hard to judge from photos, but that looks like some pretty serious exposure right before you get to #4. Is it easier than it looks? My hiking buddy read my post, and sent me a bunch of corrections. The most important of which is that all of the places where "we" were being cautious or worried about time, I should have said "I". He is also quite certain that, although it was right to take the climbers' path west through the awful brush atop Washington Column, we should have just headed uphill when we broke out of the greenery, and gone up along the side of the dome. In fact, if we had spent a little time beforehand looking at our old photos, we would have had no doubts about that being the correct path. He is correct that I was being cautious and depressed that morning. In fact, I felt like I was coming down with the flu. He points out that this may be because I'm old and decrepit, but also because I was coming off three months at sea level, had an eyelid infection, and had had only two bananas and a candy bar for breakfast (because the Curry dining room at 7 am decided to let only kids with green armbands into breakfast, and twenty minutes later the regular line had still not moved at all). I know where this is headed. He has to go back, to prove that he is right. But let me say it again: If you aren't a climber, and don't like exposure, then the North Dome Gully is not your hiking route. The rest of the loop that we did is fine. But no matter how you cut it, this trip still has 5000 feet of off-trail, steep uphill to do. Over 2000 feet in the first mile. If you are slow at route finding, you may run out of daylight before you get down off Basket Dome. Of course, when you get to the North Dome saddle, you can always just take the trail over to Yosemite Falls and go down that way. Thanks much for the trip report! I'm looking at your route map and I see you hiked from the north end of North Dome down through the forest and up Basket Dome. 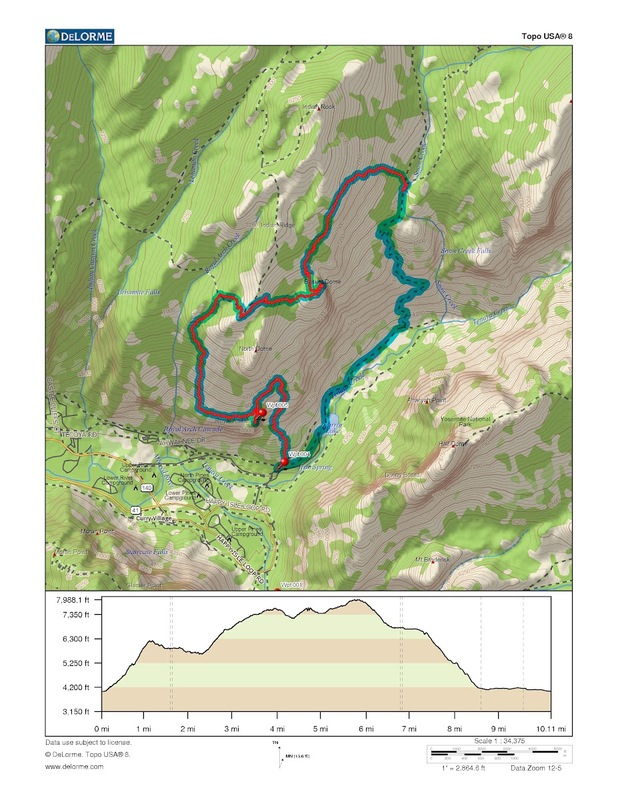 My friend and I have been looking at this route but haven't tried it. We're just hikers, no climbing, but we do some off trail. How was that section? How steep is the ascent to Basket Dome? Do you think some average hikers who have gone to North Dome from Tioga Road could make it? We've been up to Medlicot Dome, Peak 10450, and the ridge between Cathedral Peak and Echo Peaks. From the saddle of North, it's a rather tame cross-country trek over to Basket. Going up Basket isn't so steep - I chose a route through the trees. Right. Very easy. The only choice you have to make is whether to drop down a bit first, to avoid some bushes, then head back up, or try to go straight across from one saddle towards the other. I can't imagine anyone having trouble. You can see where you are headed, and the dome itself is an easy walk-up. You can't actually get onto Basket Dome from its saddle. Don't go that far. The walk up is on the flank towards North Dome, so just head on up as you approach the dome. I have finally gotten a good look at the photos from the trip. Photos of North Dome from Sierra Point and from Illilouette Ridge make it seem likely that either side of North Dome should be easily doable. I expect that we will do a loop hike around North Dome some time soon. Of course, you never know what you'll find until you look. Probably no one noticed me in Z Zen Tree... but it's a simple trek up any way you go really. And thanks wherever for even thinking of going to look for my camera. That's what I was trying to remember! You are so inconspicuous in that tree that I just passed over it in my search for your previous report. Maybe all those Twinkees have stunted your growth. Yes, it's pretty well dried up. There was a slight dribble over towards North Dome that could have been tapped in an emergency, but after that we saw nothing. There was a bit of talk about North Dome gully. I had never heard it called class 2 til then. And yeah, sorry it's imbedded in a lot of other gunk. Yes, I did ask before and I appreciate your answer. The route on your map was a little different from what I was looking at and the route above was exactly what I was looking at so I wanted to ask again. Now I know for sure. It's likely we'll try this sometime this summer. short time. If you are doing a lot of bush-a-whacking ... you did it wrong. And I applogize. Cautious is a good thing on routes like this. Very impressive. Thanks for the report! good write up, I had considered trying to find this route myself but will hold off until I can go with someone that has done it.